You aren't limited to those dimensions. Pick the closest template to the size you want. If you want a really big map, for instance, pick the 10,000 x 8,000 template. Then unfreeze all layers, and freeze the Merge layer. Then type SCALEXY, select "All", and modify the X and Y dimensions by the amount you need to get the map size you want. If you want a map 30,000 x 40,000, for instance, you'd multiply the X dimension by 3 and the Y dimension by 5. Freezing the Merge layer ensures the scale bar doesn't get resized. You can skip that step if you plan to delete the scale bar and replace it with a different one. Then to restore things back to normal, unfreeze the merge layer and freeze the map border layer. I'd like to see those maps you've created. I am a bit confused. The only templates I see that I can choose from is 1000x800 =\. Sounds strange. If you select the "Overland Maps" option, and "Pick a Pre-Defined template", there should be templates of a lot of different sizes (Several versions of 1000x800 though, since it is a useful size for many purposes). If you don't see any templates at all other than 1000x800, you should take a look in your CC3\Templates\Overland Maps directory to see what is in there. If you only have 1000x800 templates, you'll probably need to reinstall CC3. The method for resizing templates described by DarrenHill above works nicely even if you don't have an appropriate template though. Posted By: DarrenHill You aren't limited to those dimensions. Where do you type SCALEXY? Posted By: FarsightX3 Where do you type SCALEXY? Just type it. It will show up in the command line at the bottom of the screen. As long as you don't have a dialog up, or the program is waiting for other kinds of input, everything you type will show up there, including feedback to the commands. Once you have typed the command, followed by enter or space, you will see it will start asking for several parameters down there, which you must input to finish the command. 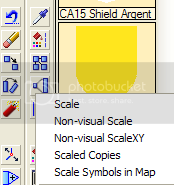 Alternatively, you can right-click the scale button, and choose "Non-Visual ScaleXY" which is the same command. Where do I select all? Do i just drag and high light the whole canvas? 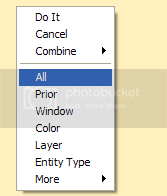 To select everything (Assuming you have shown and unfrozen layers and sheets as described above), just right-click in the drawing area when it tells you to select stuff, and select "All" from the popup menu. You should notice that everything gets selected. Then just press "d" for done, and it should proceed to the next step. 4. Make sure no dialog boxes are open on the screen. 5. Type in SCALEXY. The command should appear in the command line at the bottom. Hit enter. 6. A prompt now appear, asking to select entities. Hit the a key to select all, the number of selected entries should now show 10 or more entries, depending on the template. Then hit the d key for done. 9. Now it asks for scale center. The default is good, so just hit enter. 10. It should now be resized, but you need to redraw to see it properly. Hit the redraw button and you should notice the map is now significantly larger. Hit zoom extents to see the entire map. 0. Just in case you forget, thaw the Map Border layer, and optionally, freeze the Merge layer. Then right-click again to get that list back, and click "Do It". 3. Now, look at the botton left of the screen, just above the start menu (assuming CC3 is maximised). This is the command prompt. It's asking how much you want to multiple thye X dimension. You can either right-click to accept the value listed, or type a number and press enter. 4. You'll then get a similar message, asking how much you want to multiple the Y dimension. Again, right-click to accept the default, or type a number and press enter. 5. Now look at the command prompt - it says: "Scale Centre [0,0]" (well there are a lot more noughts). Here it's asking you for the centre of scale effect. Just rightclick to accept the default. 6. And that's it, it's done. But it's helpful to see alternate descriptions of the same process. Two different explanations for the same thing never hurt though. I see you went the mouse route, while I went for keyboard commands. It's one of the many things I love with CC3, you can use multiple approaches to do the same thing. One thing worth noting: you don't need to calculate these values yourself. Say you are using a template with a dimension of 800, and you want it to equal 15,000.
and hit enter, CC3 will perform the calculation for you. Well, i didn't know about the a & d keyborad shortcuts! :) I'll definitely be remembering them and looking for others. Thank you Darren and Monsen!!! It really helped. I really apprecaite it. You wont believe me but I only use the basics of CC3 from the maps I have done =p. It really helped alot! Well it worked for the first time. But if i want to do it again it crashes CC3 =(. Anyways I did get it to work. Last and final question. How do I know what to put into the x and y for the different sizes i want. Say i want an x of 4000 and an y of 3500. Do I simply just put 4000 in the x command space and 3500 in the y command space? How did you come up with the number 15 and 18.75? I did, but the image hosting service you used gave me some problems. I'll check them out later. One more thing. If someone lets you see their FCW, how do you find out what dimensions they are using for the canvas size? Use the Distance command from the tool menu. Do remember that CC3 does not actually have a fixed canvas size at all though. The dimension listed for any given template is basically just the size of the drawing that makes up the template. You can draw outside of this area if you wish (That is why the resize trick in this thread works so nice, since no matter what template you use, you have basically unlimited drawing space).